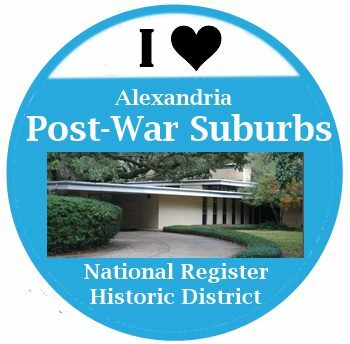 The celebration will recognize the listing of the Alexandria Post-War Suburbs Historic District on the National Register of Historic Places. Residents of the district and the Alexandria community will be celebrating Louisiana’s first mid-century modern National Register historic district. Be a part of it! Where: In the district gathering on Kimball Ave. near the corner of Madonna Dr. 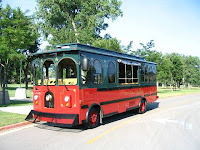 Guided tours on the trolley bus departing about every 30 minutes (approx. 25 passengers). The route starts on Kimball near Madonna, then west on Madonna, south on Pierson, west on Elliott, north on Maryland, east on Pershing, and south on Kimball. Walking tours available – Self-guided throughout the district; brochures will be available or you may download. For detailed descriptions of the houses on the tour, view or download here. Use caution on streets. Homes are not open; please do not go on properties. Coming to the celebration from outside the district? To avoid congestion, consider parking outside the district as there will be trolley tours and self-guided walking tours within the district. 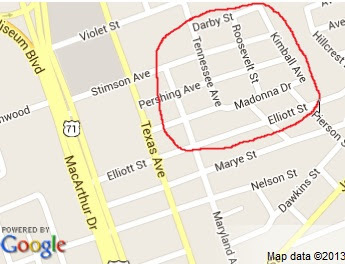 If driving into the district, consider turning from Texas Ave. on to Stimson Ave.
View TV coverage from KALB-TV from July 5.